Given the ongoing risk of infectious diseases worldwide, it is crucial to develop appropriate analysis methods, models, and tools to assess and predict the spread of disease and evaluate the risk. Analyzing and Modeling Spatial and Temporal Dynamics of Infectious Diseases features mathematical and spatial modeling approaches that integrate applications from various fields such as geo-computation and simulation, spatial analytics, mathematics, statistics, epidemiology, and health policy. 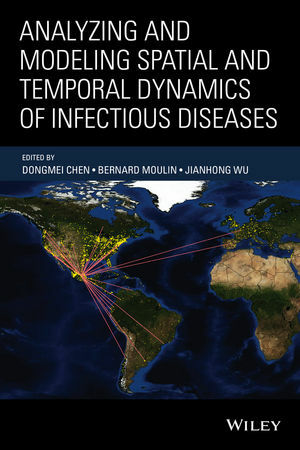 In addition, the book captures the latest advances in the use of geographic information system (GIS), global positioning system (GPS), and other location-based technologies in the spatial and temporal study of infectious diseases. Analyzing and Modeling Spatial and Temporal Dynamics of Infectious Diseases is an excellent resource for researchers and scientists who use, manage, or analyze infectious disease data, need to learn various traditional and advanced analytical methods and modeling techniques, and become aware of different issues and challenges related to infectious disease modeling and simulation. The book is also a useful textbook and/or supplement for upper-undergraduate and graduate-level courses in bioinformatics, biostatistics, public health and policy, and epidemiology. Dongmei Chen, PhD, is Associate Professor in the Department of Geography and Director of the Laboratory for Geographic Information and Spatial Analysis at Queen’s University, Canada. Bernard Moulin, PhD, is Professor in the Department of Computer Science and Software Engineering at Laval University, Canada. Jianhong Wu, PhD, is Canada Research Chair and University Distinguished Research Professor in the Department of Mathematics and Statistics and Director of the Center for Disease Modeling at York University, Canada.